Make sure you’re always on the same page. Each department’s Vision/Traction Organizer™ is immediately accessible from the Level 10 Meeting™. Use the V/TO as a handy reference during Quarterly Conversations™ and Annual Reviews. The software prompts you to print it out as you prep for your meetings. As your leadership team rolls out The Entrepreneurial Operating System® throughout the company, your V/TO is right there in easy reach, from Day One. 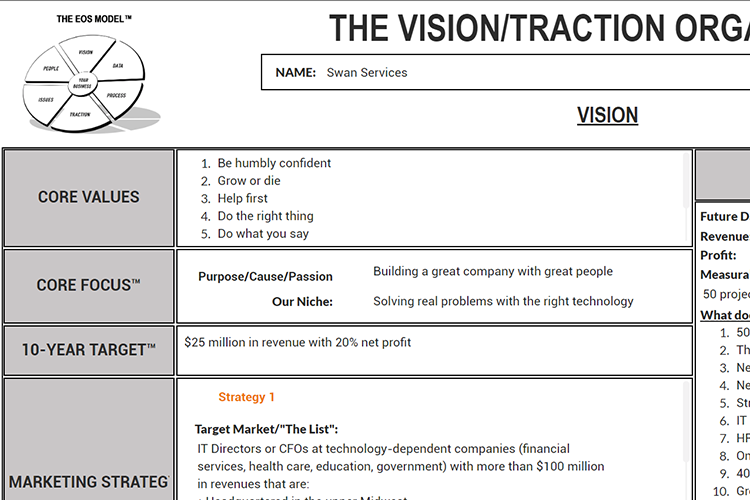 The Vision/Traction Organizer is your company’s greatest tool to communicate your Vision, gain Traction® and get to the next level. Traction® Tools software for EOS® gives you the complete V/TO at your fingertips. It’s always where you need it, when you need it. Traction Tools integrates the content of the Vision/Traction Organizer throughout the software, so that your team always has the right information waiting for you at the right time. Core Values are imported into Quarterly Conversations and Annual Reviews, and they can be added to your personal Workspace. Departmental Rocks are automatically imported from the Level 10 Meeting into the department’s Departmental Plan (its own Traction page of the V/TO). With Traction Tools, you’ll get to the next level in no time! Traction Tools has helped the EOS Worldwide leadership team, my EOS Implementer practice, and many of my clients run more efficient Level 10 Meetings, keep a V/TO and Accountability Chart at hand. Traction Tools has made it incredibly easy for us to roll out EOS across the business. All teams have access to digital versions of our Accountability Chart and V/TO, so that our vision for the business is shared by all.